Address: Office of Divisional Forest Officer Working Plan-II/Provincial REDD+ Coordinator Provincial REDD+ Cell Forest Complex Soan Camp GT Road Rawalpindi. Get Forestry Wildlife and Fisheries Department Punjab Jobs 2018 Rawalpindi Latest Advertisement on this page. 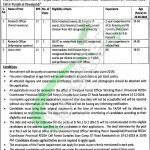 The Government of the Punjab, Forestry Wildlife and Fisheries Department is looking recruit following positions for the different development project named as "Establishment of Provincial REDD+ Cell in Punjab at Rawalpindi". For this purpose, it invites applications from the Punjab domiciled candidates for the posts such as (Research Officer (Forest Inventory), Research Officer (Information Systems), Junior Clerk). Appointment of above-mentioned positions will be done on a pure contract basis and the duration of the contract is extendable on satisfactory performance. Candidates from Punjab Province can apply for these vacant positions but they should have valid Domicile and relevant qualification and experience as per the eligibility criteria which is mentioned separately for every position and generally, Masters/Graduation/Intermediate qualification is required for different posts. So, for interested candidates, we have provided complete how to apply procedure in the very next heading. The last date for submission of application is December 14, 2018. Incomplete applications or applications not received through proper channel and after the deadline will not be entertained. Government servants may apply through proper channel. Only shortlisted candidates will be invited for interviews/selection process. Department reserves the right to increase or decrease the number of vacancies without any notice. Stay in touch with us and keep visiting our site JobsAlert.pk for more jobs. Last Date to Apply: December 14, 2018.